What is Papà Paolo Like? Papà Paolo has players competing to become the number one pizza delivery service in Naples. 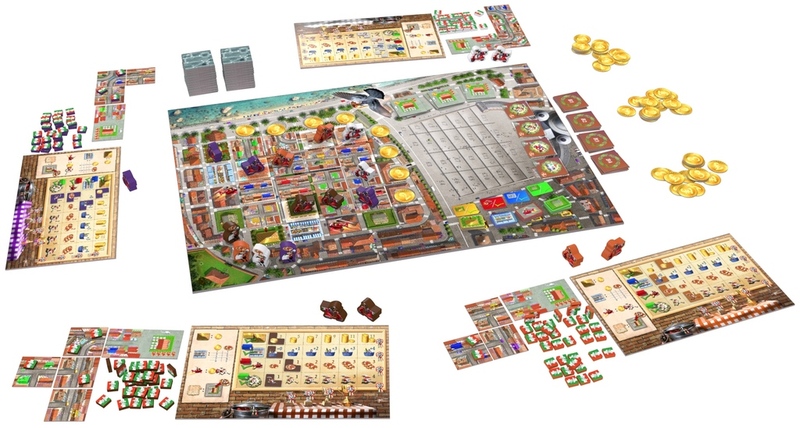 To establish the most successful business, players need to cleverly invest in their own pizza empire, make well-considered bids on delivery tiles and create a well-thought-out layout of their city district. The game plays in five rounds, each round split in several phases. First, all players place their four workers one by one on a 4×4 grid that consists of city tiles and either take the tile or perform the related action. Careful deliberation is required, as each player also must try to secure majority in the rows and/or columns of the grid. The main characteristics of each city tile are its connectivity and the number of clients depicted on it. The more clients (colored roofs), the more points that tile can score, but the longer it’ll take to advance the matching experience track. The possible grid actions are “seeking funds” (get income), “buying ingredients” (get pizzas), “express delivery” and “building a new pizzeria”. Next, the majority keepers in rows and columns are awarded extra income. Then everybody’s in for an intense bidding phase that will determine three things: the number of pizzas and how far you can deliver them, which important additional investment tile you are able to secure, and the play order for the next round. Your chosen investment tile can be used as an extra action or to advance on the corresponding experience track. During the final phase in each round, each player sets out to deliver pizzas and levelling up experience. For each city tile of which all clients got served, your matching colored experience track advances by one, making your actions more powerful as the game progresses. During the worker placement and bidding phases the player interaction is very high. Delivering pizzas is an interesting puzzle each player solves solo on his/her own personal city district, with a great feel of accomplishment when all goes as planned. End scoring is swiftly done by counting points for all four experience tracks, 1 point for each delivered pizza and 1 penalty point for each prepared undelivered pizza. Quined Games maintains the high production value of their Masterprint series. The main board and player boards are of sturdy cardboard. 150+ stickers make the wooden player pieces come to life and the rulebook is well written with many examples. The detailed and vibrant artwork of David Cochard radiates a sunny Mediterranean atmosphere and emerges you in the bustling crowded city life of this Italian municipality. 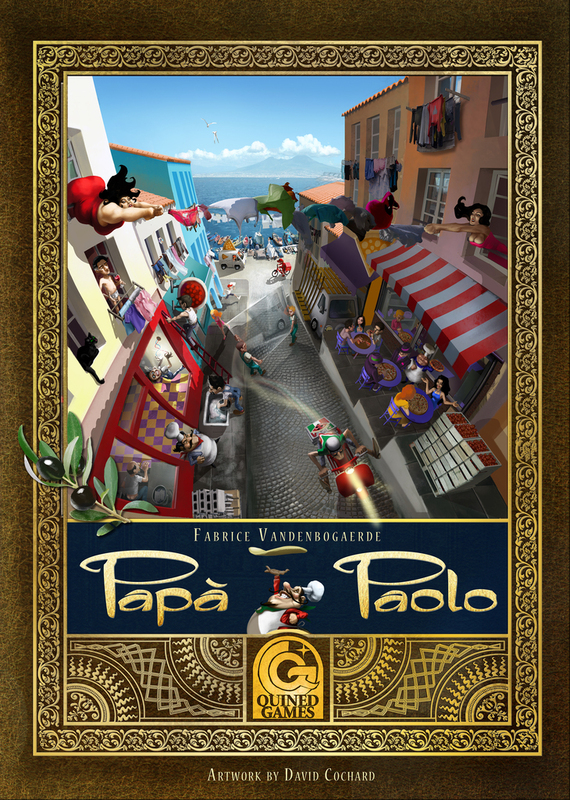 Papà Paolo was an unexpected purchase I made at Spiel 2016 and its accessibility and short playtime has meanwhile made it hit the gaming table often. A considerable amount of depth is hidden under the easy rules and smooth gameplay. Careful planning and adaptability are required to be successful. Designer Fabrice Vandenbogaerde initially saw this project as a simplification of the game “Warlock”; a game of wizardry with gnomes and mystical creatures. Throughout the designing process, this board game changed theme like a chameleon. Nonetheless, delivering pizza in the city of Naples doesn’t feel like a stick-on and gameplay is intuitive. Each action makes thematic sense, giving an easy flow to the game and letting that rulebook stay tucked away in the box. The difficulty in a game of Papà Paolo is to get everything to add up. All your actions are interlinked and one miscalculation can let all your clients stay hungry for the round. The tightness of the game makes for hot-blooded action snitching and high-staked auctions. Luckily it never gets too personal, as persistently blocking other players will make your own engine sputter, causing your delivery men’s scooter to run out of fuel and break down mid-delivery. @wr00t Yes, you do!! My boyfriend did that chore for me. Now it turns out in the first print run the italian flag is printed inverted I want to have them all redone!! !